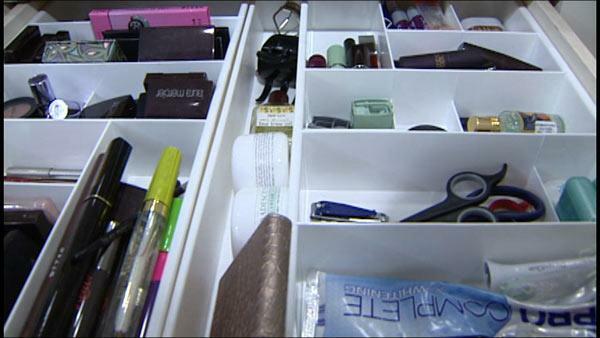 If your bathroom is cluttered and disorganized, here are some great tips from a professional organizer on how to streamline and organize your makeup, beauty products and tools. Alyson Davis' disorganized bathroom looks like many of our bathrooms. "I go through once or twice a year and try to throw things away and organize, but I kind of lose interest about half way through so it just compounds," she says. So, professional organizer Julie Hibbs has her work cut out for her! "People's bathrooms get cluttered because they're in there every day. You've got a thousand opportunities to just drop things all day long and not even pay attention to it.," says Julie. "Plus, I think, especially when you're in a bathroom, you're typically moving at a faster pace than you want to be, so you tend to not put things away or you tend to dig for things." Start by taking everything out where you can see it. Don't worry that you've just made an even bigger mess! Make "categories" with your items (hair, makeup, cleaning supplies, etc.). Go through each category and decide what to keep, throw away, donate, give away, etc. Of what's left, decide where you'll store each category. If you need storage containers and solutions, look around your house for things you can use before you buy. Throw away large, bulky, or odd-shaped packaging. Opt for clear, plastic boxes that stack easily. If you're keeping a box until you know you like the product, be sure to throw away the box after you decide to keep it. If you have trouble parting with an item, store it in a box with a date on it for six months. If you don't use it in that time, you can safely get rid of it and know you don't really need it. Keep your jewelry in your bedroom or a closet, rather than in the bathroom, as the moisture in the room can make jewelry tarnish more easily. Julie's tips really helped Allison transform her space from cluttered and disorganized to neat and tidy. "We got rid of so much stuff. I have my space back. I love it," says Allison. "Your bathroom is one of the first places we go in the morning, so if you can make the process and that experience in your bathroom more pleasant and be able to find things more quickly, I think you can put yourself into a better mood for the rest of the day," says Julie. For more from Julie, visit squaredaway.com.